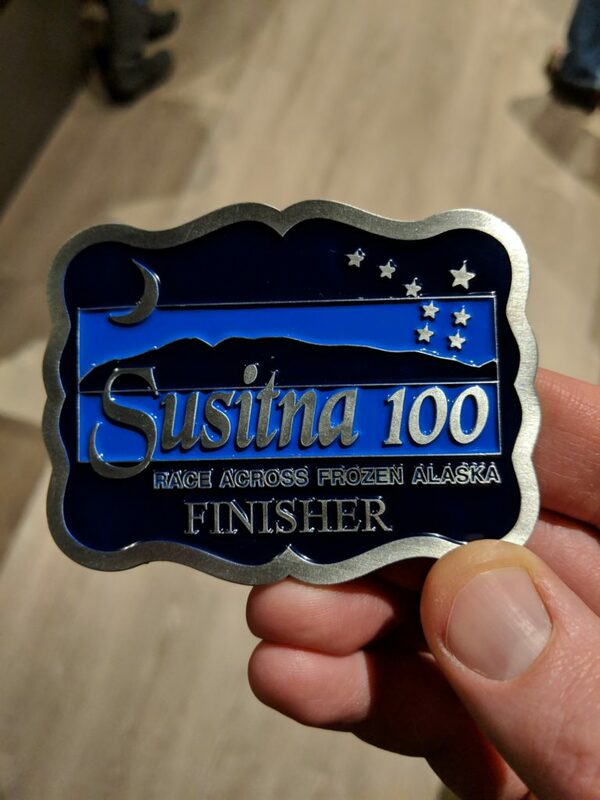 I recently completed my 3rd Susitna 100. This year was truly epic and unforgettable. 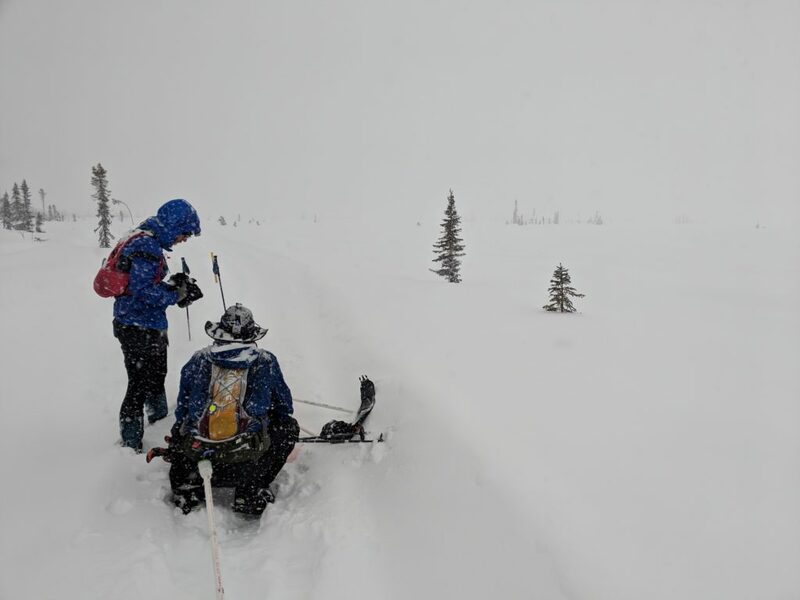 In the days leading up to the race, the forecast was calling for anywhere between 8-12″ of snow to fall during the race, and we knew we were likely in for a long haul. The race started out innocently enough, around 10 degrees on hard packed trails. We were beginning to think that we might luck out with better weather than expected. Oh what fools we were! Almost immediately, the snow began to fall, and continued pretty steadily for the remainder of the race. 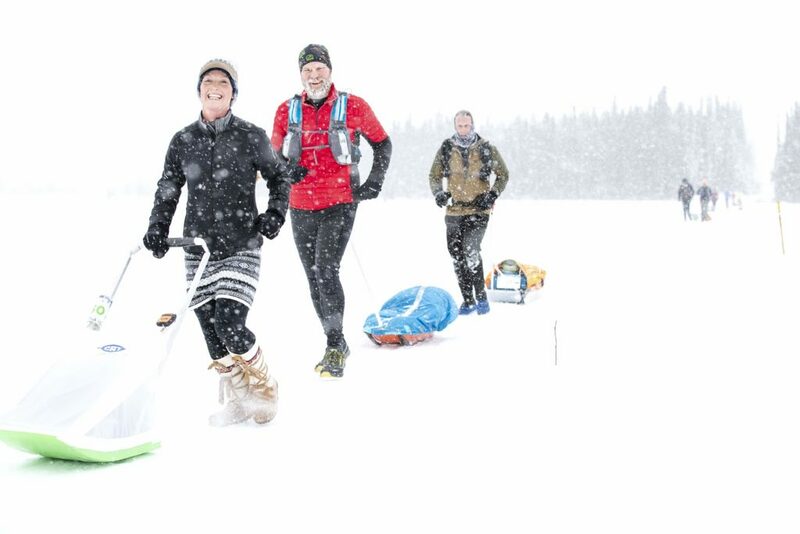 Still, we started out in good spirits, laughing and joking as we slowly began to spread out in the early miles. All smiles in the early miles! Photo by Andy Romang. I started out with my cousin Sarah, but by around mile 20, she was starting to fall behind, and waved me ahead to go on without her. I pulled into the first checkpoint, Pt. Mackenzie, 22 miles into the race, still feeling pretty good. I refilled my water, quickly downed a Dr. Pepper, and grabbed a paper cup full of M&Ms to take with me. I saw Sarah one last time, as she arrived at the checkpoint just as I was leaving. I was still running pretty well along the next section, 12 miles to Flathorn Lake. 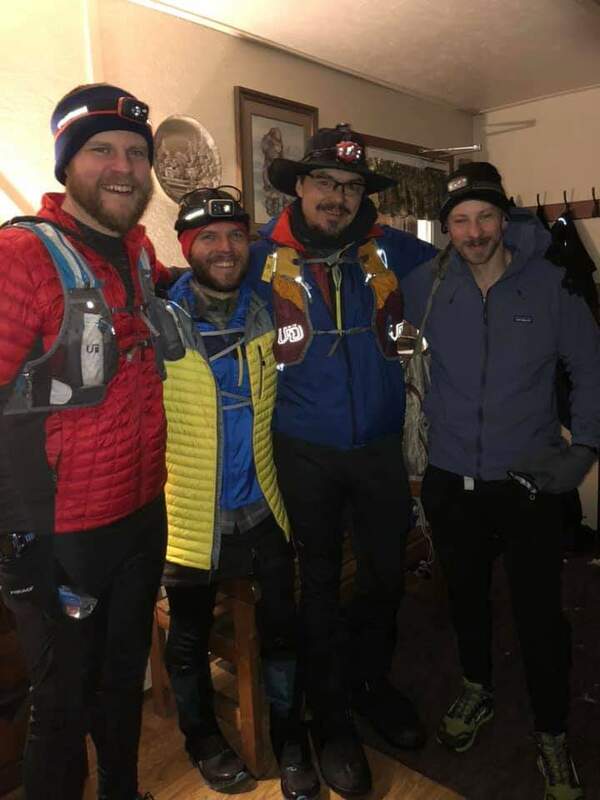 Somewhere around mile 30, I caught up to a group of friends – Martin, Stephen, and Jacob. Martin and Stephen have both completed this race several times, but this was not only Jacob’s first time at this race, it was his first 100 miler. They were moving pretty well at this point, so I decided to tag along with them to be around some friendly faces and conversation. The snow had lightened up, and the trails were still in pretty good shape. 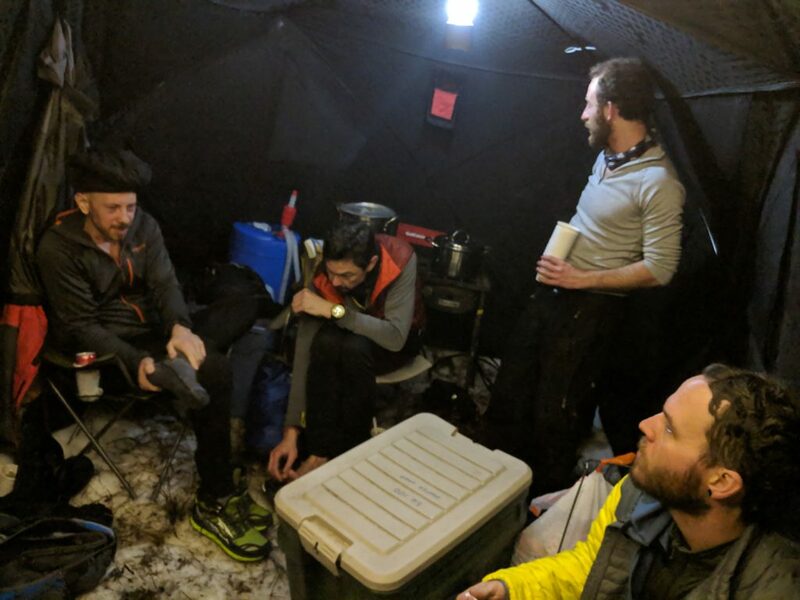 We managed to pull into the checkpoint at Flathorn Lake (mile 34) while there was still daylight, which was a good sign that we were making decent time. The thing I always look forward to the most at this checkpoint is the homemade spaghetti. I got myself a big bowl of that, a slice of garlic bread, and found a comfortable seat near the heater. 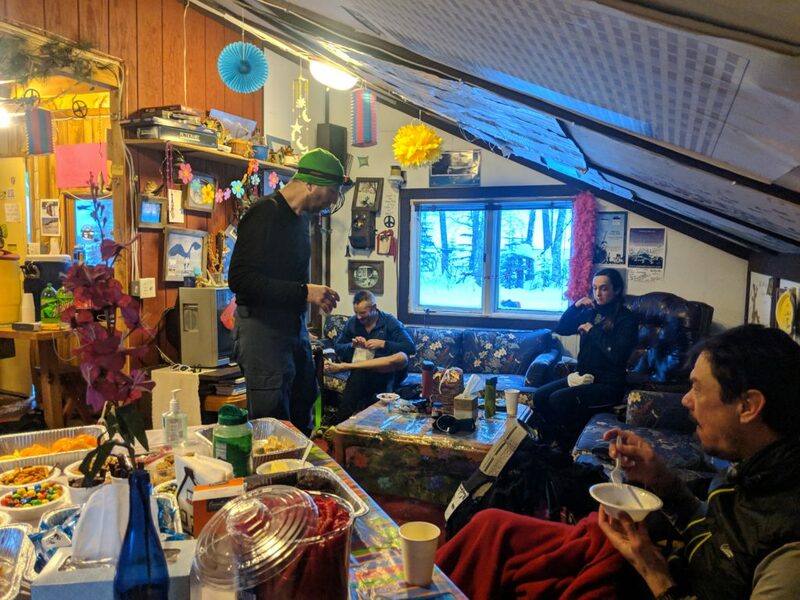 It was a pretty full house inside the cabin, but it was still early enough on in the race, that everyone was still in pretty good spirits. Always a fun time at Flathorn Lake! 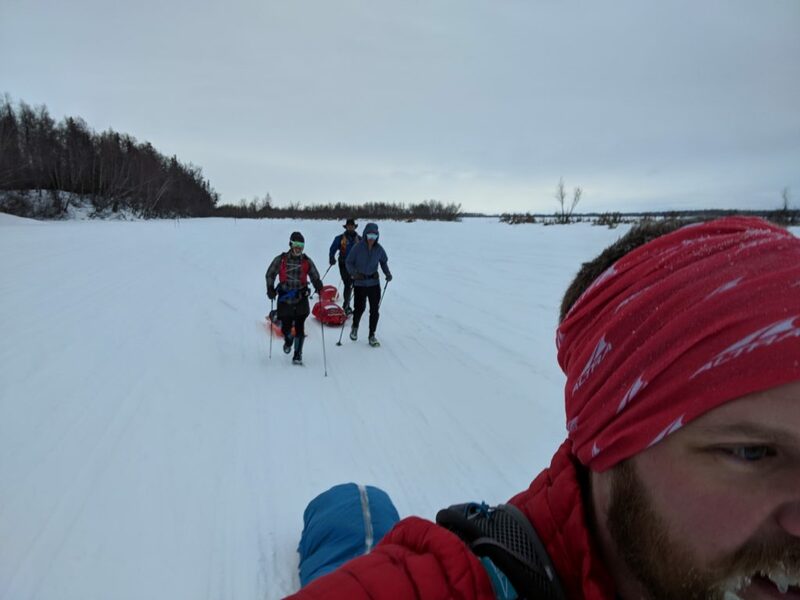 After filling our bellies and warming up a bit, we headed back out towards our next checkpoint, 17 miles away. It quickly started getting dark, and the trail was becoming softer. We crossed the infamous Dismal Swamp, which actually ended up being one of the least dismal parts of this section. 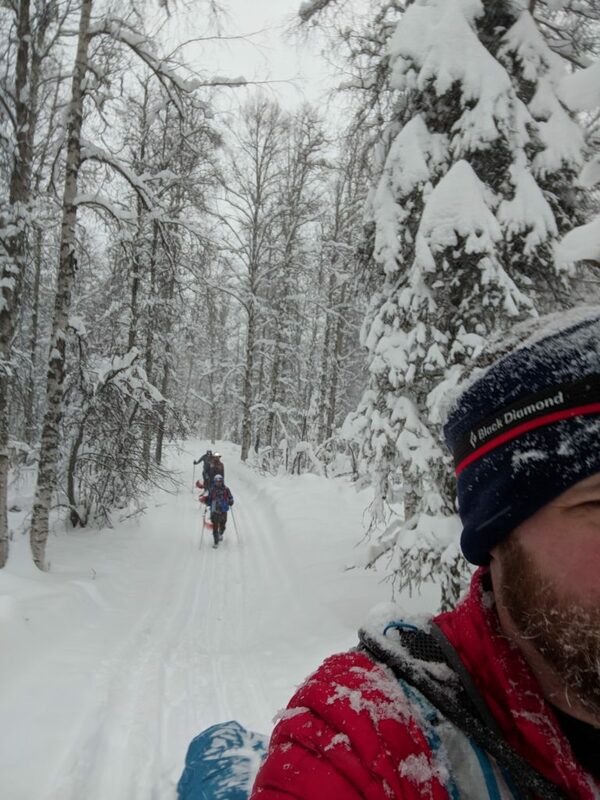 The temperature was rising, the snow was getting deeper and softer, and our speed was rapidly declining. Proof that I didn’t hallucinate this in the middle of the night! 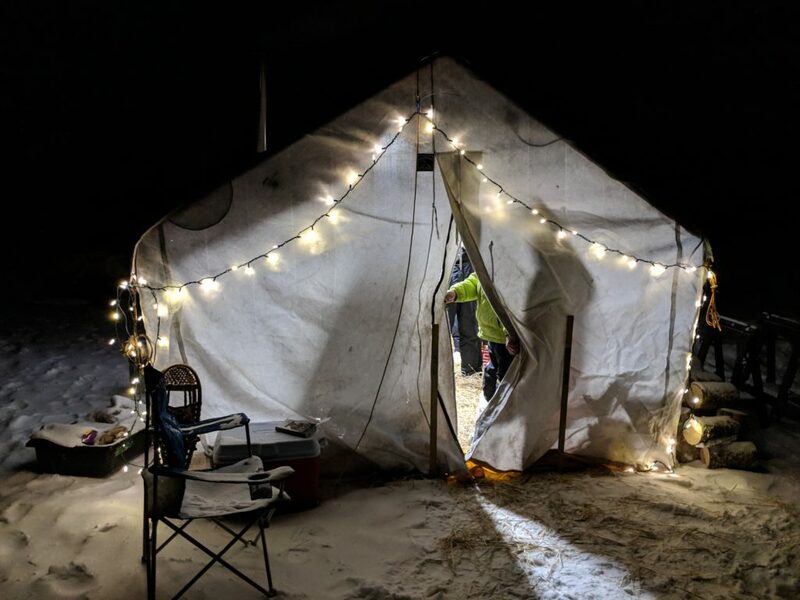 At long last, we finally reached 5 Star Tent, which is basically just a 12×12 canvas tent setup in the middle of a frozen swamp. They had it well lit up, so we could see it for quite a ways away. 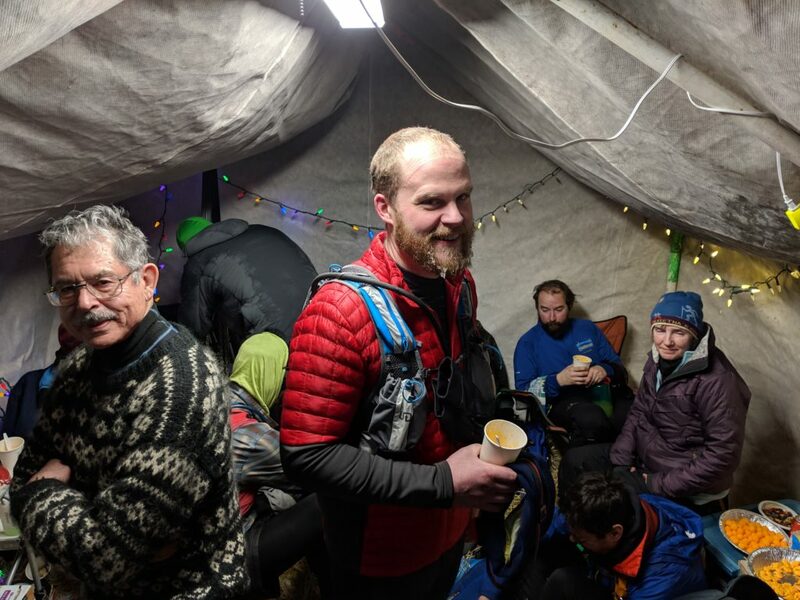 Our friend Jane was volunteering at this checkpoint, so it was nice to see another familiar face in the middle of the night, roughly halfway into our race. At this point in the race, there was already quite a bit of carnage happening. When we got there, the tent was full of mostly bikers, and it was pretty much standing room only for us. We got some warm soup and coffee, and left again pretty quickly into the night. 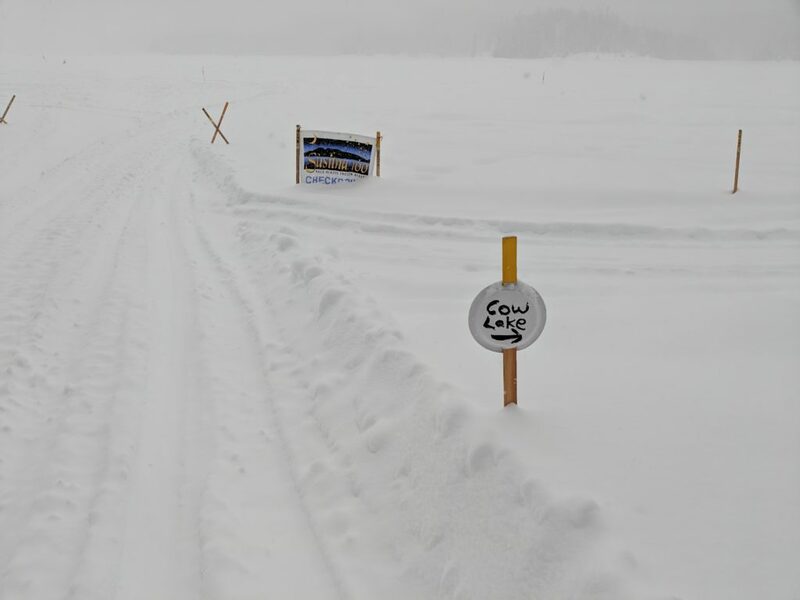 Even in that relatively short period of time, there was already a decent layer of snow built up on our sleds. The world famous 5 Star Tent! We started making our way towards Eagle Quest, our next checkpoint another 15 miles away. 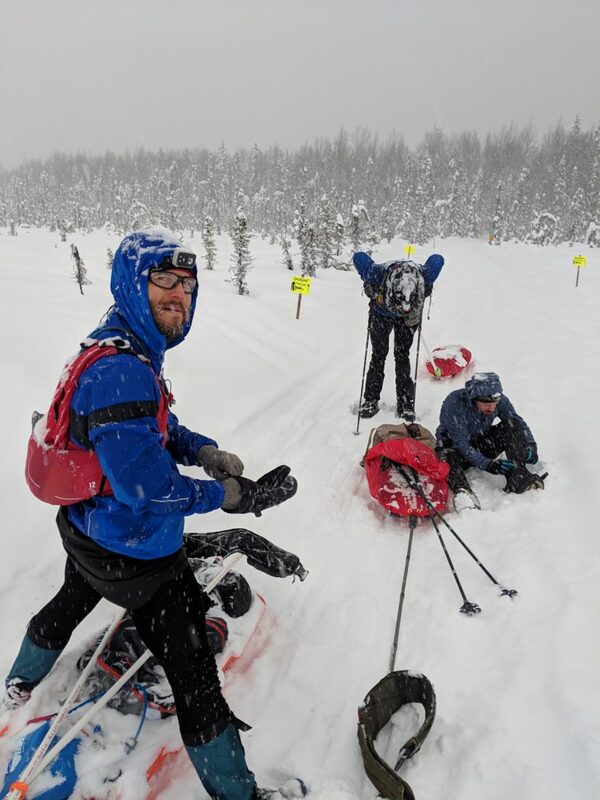 This is when our progress really slowed, as the snow continued to fall at a quickening pace. 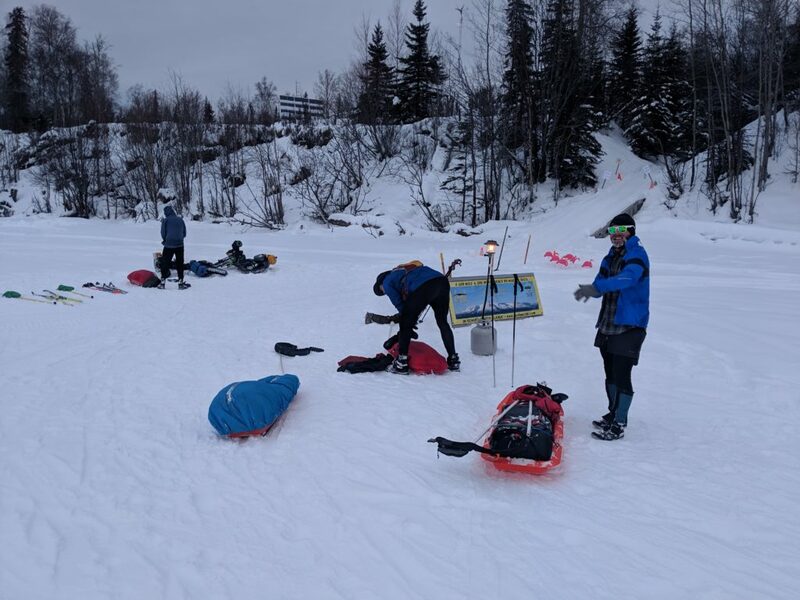 I had a slight sled malfunction a few miles from our next checkpoint, when the carabiner used to connect the pole from my sled to my waist belt ripped the loop it was connected to. After a brief moment of panic, I was able to reattach it to another loop rather quickly and continue on my way. Soon enough, we could see the lights of the next checkpoint. This is the really big checkpoint to look forward to during this race. Eagle Quest is a lodge and restaurant, so you can go in and order a warm meal. After 63 miles of eating mostly frozen food from my sled, this is a welcome change. 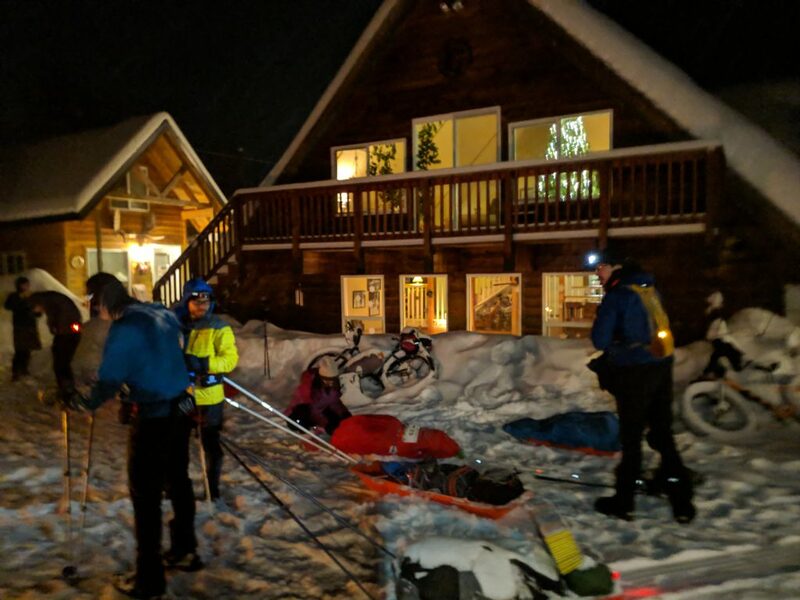 The race also rents out several of their cabins, so you can even lay down in a warm, comfortable place for a nap if you’re so inclined. After parking our sleds, we went inside and found ourselves a table in the restaurant. I ordered biscuits and gravy with a coffee, and boy did that hit the spot. We also used this time to take care of our feet, giving them a chance to dry out as we ate, and then put on fresh socks. I also changed into a new pair of shoes that I hauled in my sled. Especially with my size 14 feet, a spare pair of shoes is a decent amount of extra weight to carry for 100 miles, but in my mind it is well worth the tradeoff. We also took some time to lay out and stretch on the heated floor they have downstairs. Since this is one of the few places on the course that you can actually drive to, both Jacob and Martin’s significant others met us there in the middle of the night. That was another great opportunity to see some friendly, familiar faces. By the time we headed back out onto the trail, we had spent just over 2 hours at Eagle Quest. Knowing what conditions awaited us back out there, this long rest was a necessary luxury. 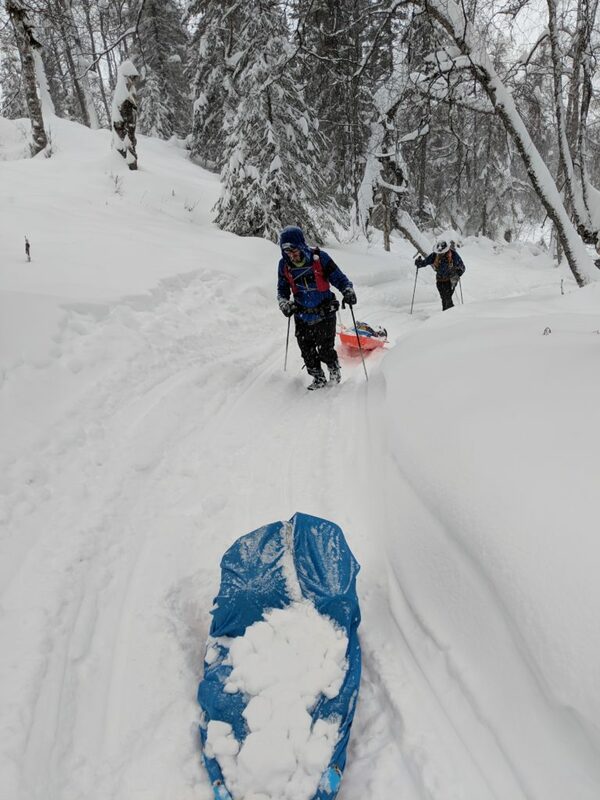 Again, our sleds were covered by a decent layer of snow that had fallen while we rested. This also meant that the trail was well covered in fresh snow. Our next destination was Cow Lake, 17 miles away. The first 7 miles was part of the out-and-back section, so we got an opportunity to see where people were at behind us. The farther and farther along we got, the longer people’s faces grew. Most of them would end up dropping at Eagle Quest. Finally, we reached a set of signs indicating it was time to make a sharp left to turn off the main trail towards Cow Lake. Unfortunately, it had probably been 5-6 hours since anyone had been on that section of trail, and there was easily 8-10 inches of snow accumulation. The next 10 miles were by far the hardest of the entire race. Luckily the 4 of us were still together, and we took turns breaking trail. At a few points, we couldn’t even see the trail, and had to just look ahead for the next trail marker and point ourselves towards that. The final approach to Cow Lake was a bit different this year, and the last couple of miles seemed to drag on and take forever. There was a very hilly section, followed by a long slog across Red Shirt Lake, until we finally arrived at Cow Lake. 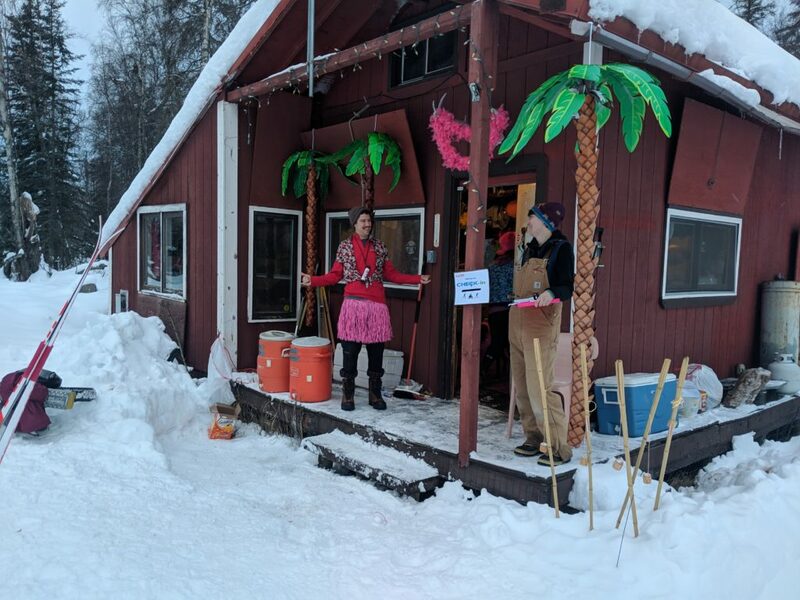 My friend Kristine was volunteering at this checkpoint, and when I got there I gave her a huge hug and told her I’d never been so happy to see her. That 17 mile section from Eagle Quest to Cow Lake took us 8 1/2 hours. The snow keeps falling, and it gets harder and harder to follow the trail. Steve’s Hill – that guy is a real jerk! After that long slog, we were both physically and mentally defeated at this point. Martin was ready to call it quits and drop, but we managed to talk him out of it. We ended up staying at Cow Lake for almost another 2 hours, resting, eating, and drying our feet as best we could. 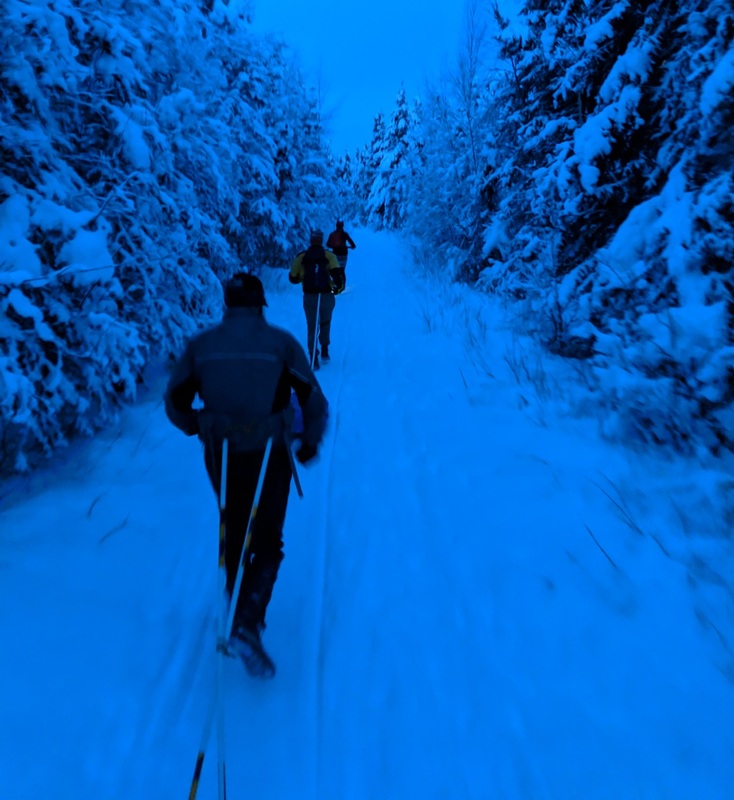 When we left Cow Lake just after 5PM, we knew that we would soon be heading into our 2nd night of the race. There was a biker from Columbia we met while at the checkpoint, and he headed out with us for company. He has raced in bike races all over the world, but nothing like this before on a fat bike. He had been pushing his bike for many hours already, and we still had 20 miles to go to the finish. (Trying to) dry clothes at Cow Lake. The next 10 miles to the final checkpoint were relatively uneventful. The trail was still soft and slow, and we were all pretty worn out at this point. But we were all determined to finish this thing, so we put our heads down and marched into the night. 5 1/2 hours later, we arrived at the final checkpoint at mile 90. Part of me would have loved to blow through this final checkpoint, just wanting to be done. But I also knew that we needed some rest and refueling for the final push. At the pace we’d been moving, we still had several more hours ahead of us. 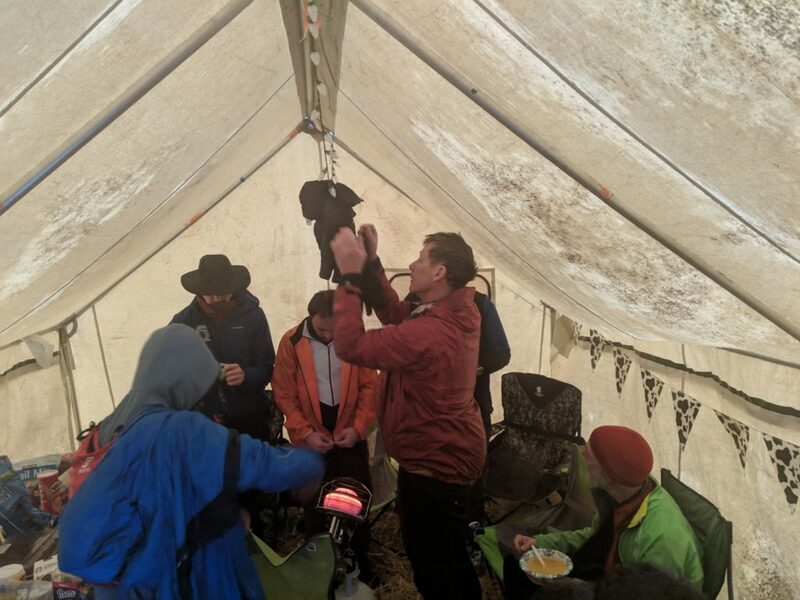 The 5 of us piled into the small tent, and sat down with some soup and coffee. After a little more than an hour, we headed back out just after midnight. 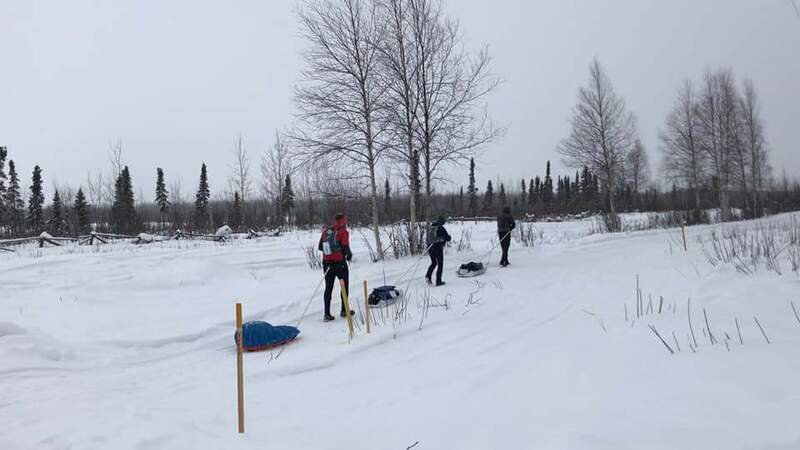 Luckily, this last section is more frequently traveled by snow machine and dog sled, so the trail was much more packed than what we had become used to travelling on. The biker from Columbia hopped on his bike and quickly pulled away from us, never to be seen again. A skier we passed on the last section passed us by as well, now that she was able to ski normally again. Most of this section is a blur to me at this point. We were all so tired, having not had any meaningful sleep the entire race. Still, we kept moving forward with our shared goal. With the improved trail conditions, the last 10 miles took us “only” 3 hours and 40 minutes. Almost 43 hours after we started, we crossed the finish line together in 42:42, a 4-way tie for fourth place. That was by far my slowest and hardest-fought 100 mile finish. The race directors said it was the worst weather the race has ever had. 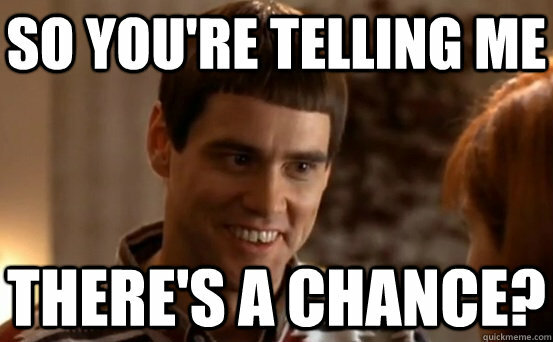 Out of 36 runners who started the race, only 10 finished. I’m proud to be one of them. 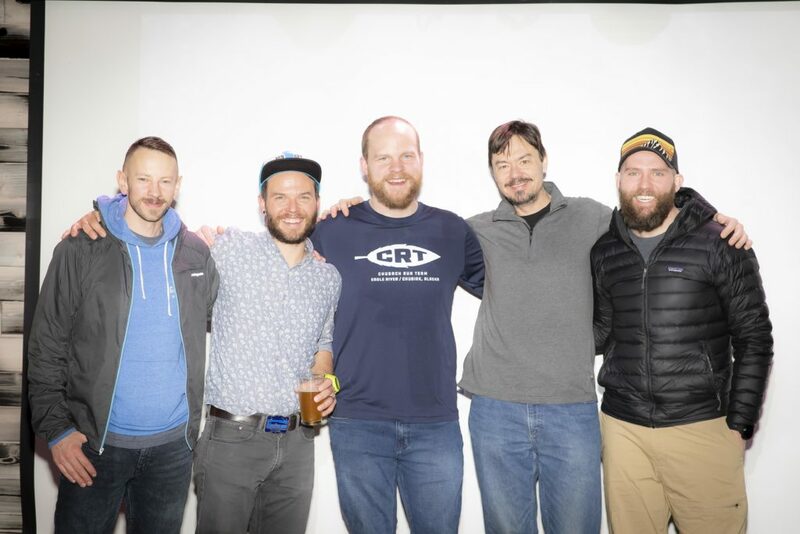 And I couldn’t be happier to have spent so many hours on the trail with 3 great friends, and to have shared that finish together. Still smiling almost 43 hours later! I ran 100 miles through a snow storm and all I got was this stupid belt buckle! Living it up at the after party. Photo by Andy Romang. This upcoming February, I’ll be running the Susitna 100 for my 3rd time. When I ran it last year, I left my sled unchanged from the previous year. 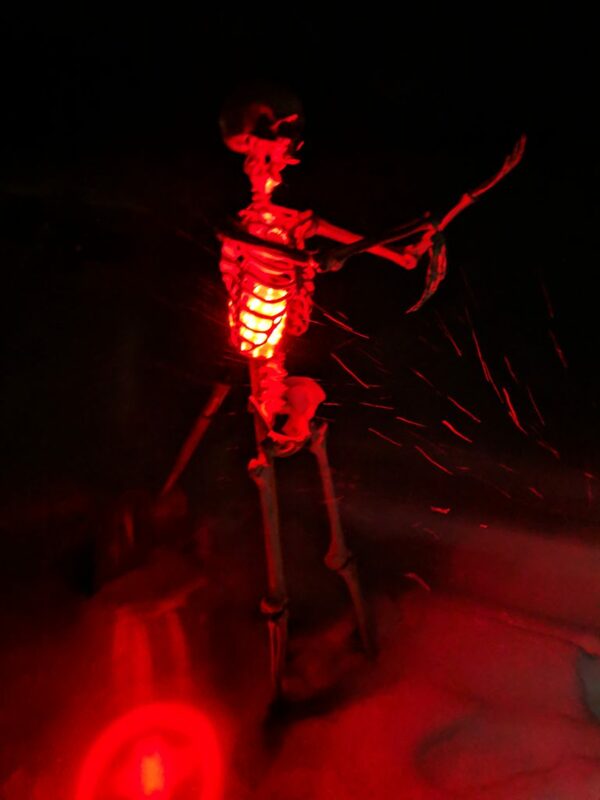 This year, I decided to make a few modifications. 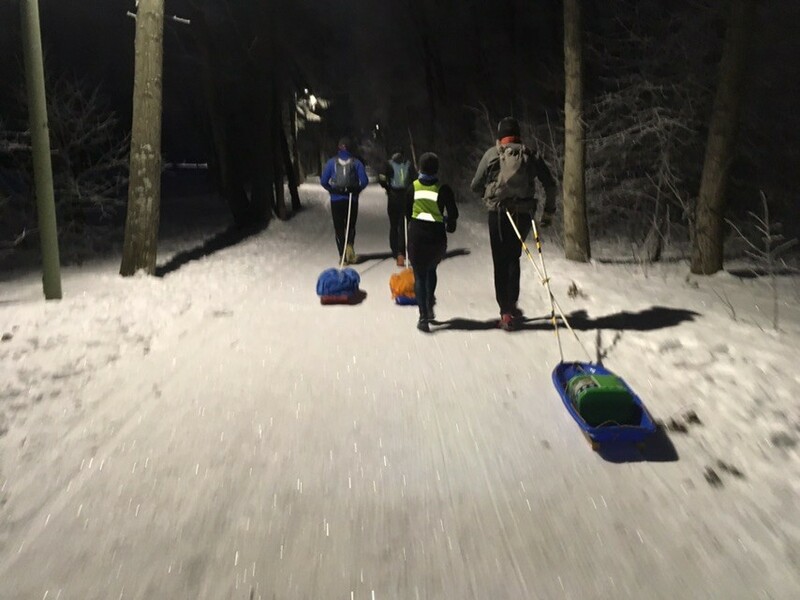 During the race last year, I made a point to pay attention to other runners’ sleds, and noticed quite a few using only a single pole. The double pole setup is really for stability and helping to keep the sled tracking behind you when you’re going downhill. 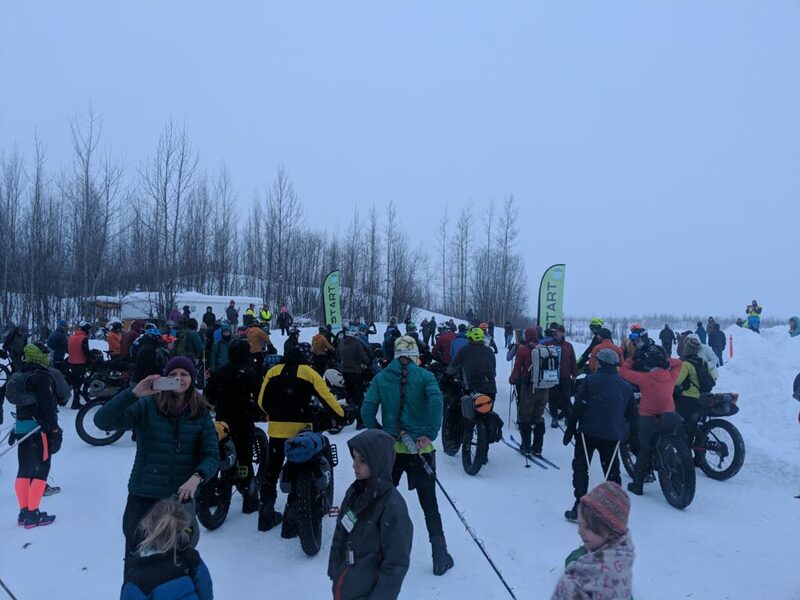 Susitna 100 is a very flat course overall, so I really don’t think that’s necessary, and I’d like to try and cut weight this year anywhere I can. 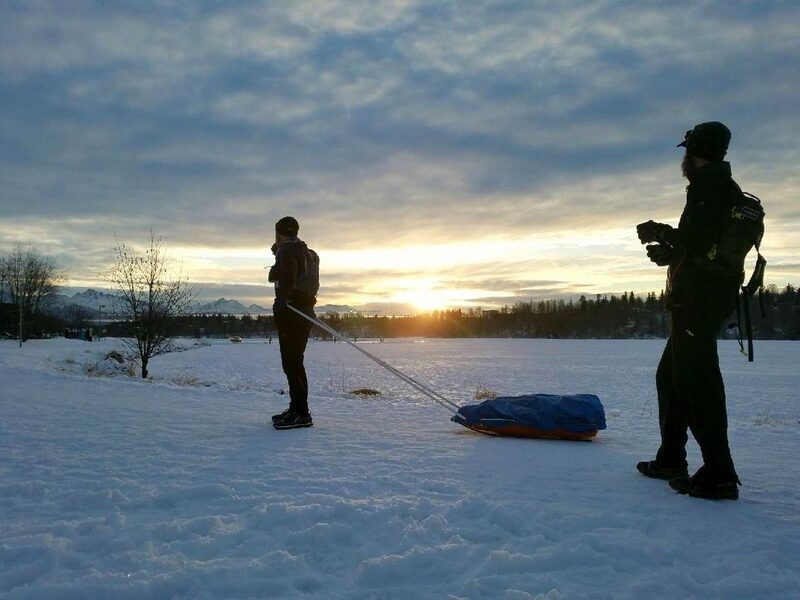 After deciding to drop down to a single pole, the next decision was how to attach it to my sled. Previously, I just used rope running up the center of the pole, which is effective, but doesn’t do much for stability. Since I’d be losing the stability of the double pole setup, I wanted to do something different. 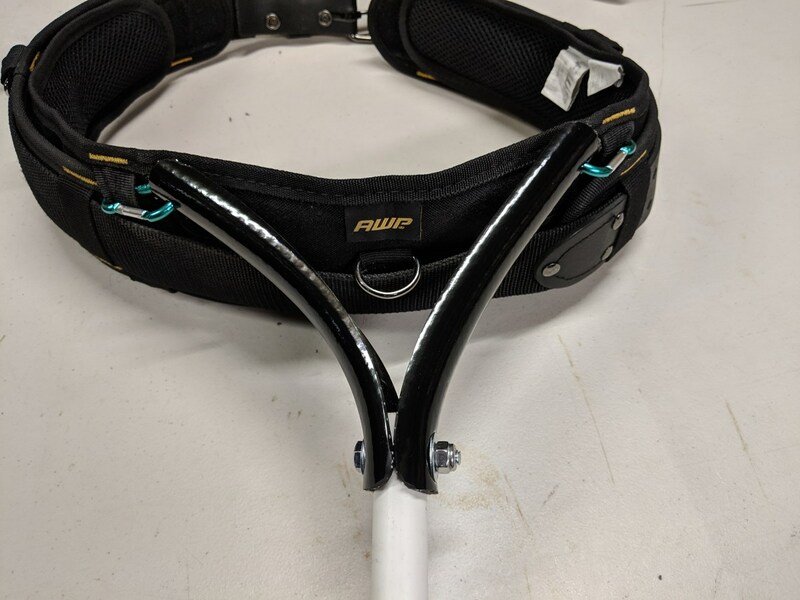 I bought some stiff rubber tubing, cut it in half lengthwise, and used that to attach the pole to my sled, and to my belt. 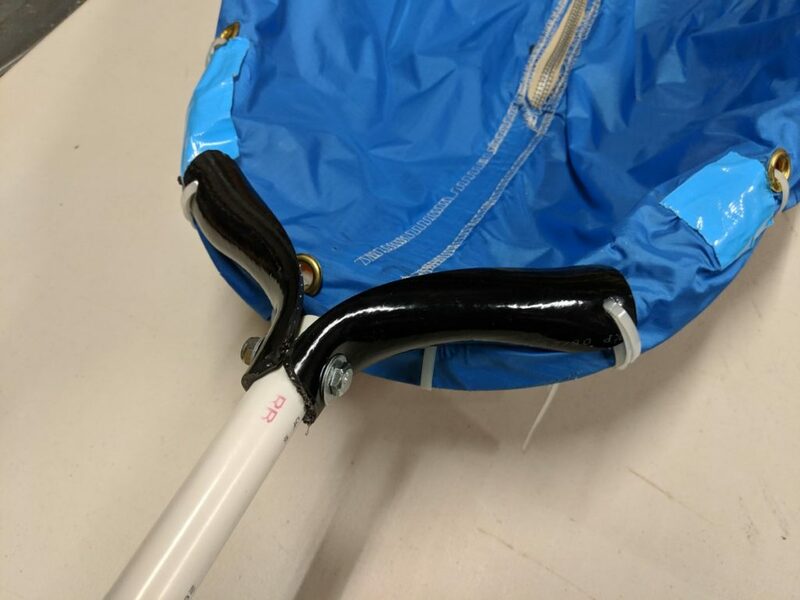 The tubing is stiff enough that it doesn’t allow the sled to flop around, but has enough give to act as a mini shock absorber. This summer, I’ve been doing as much climbing as possible to prepare myself for this race. 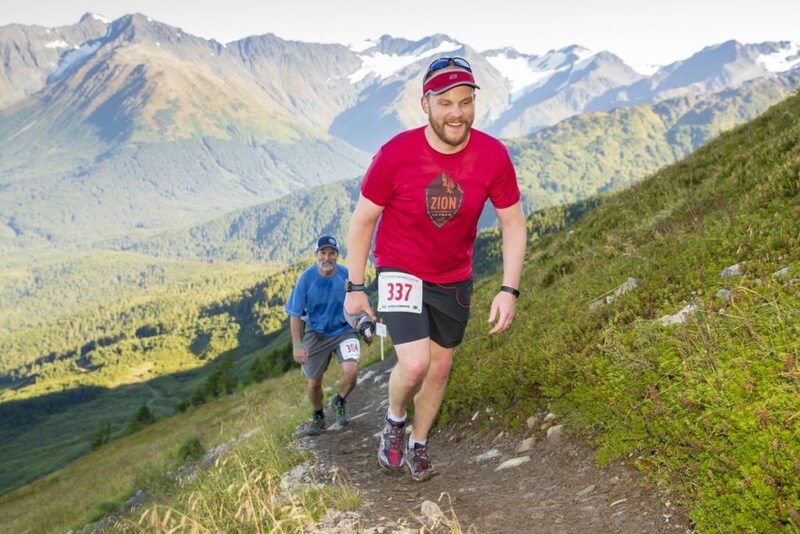 Earlier this month, I did the Alyeska Climbathon, which is a timed race where you climb the Alyeska North Face trail as many times as you can in 10 hours. Each lap is around 2.25 miles up, with 2,200 feet of climbing. After reaching the top, you take the tram back down and start the next climb. I ended up completing 6 laps for just over 13,000 feet of climbing for the day. The weekend before that, I ran the Day at the Beach 24 hour race. 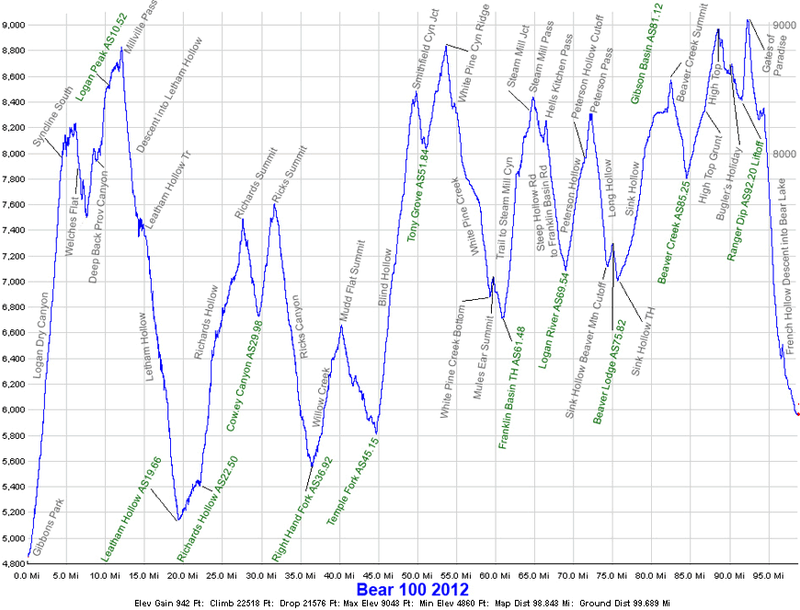 I wanted to take it relatively easy, since it was only 4 weeks out from Bear. 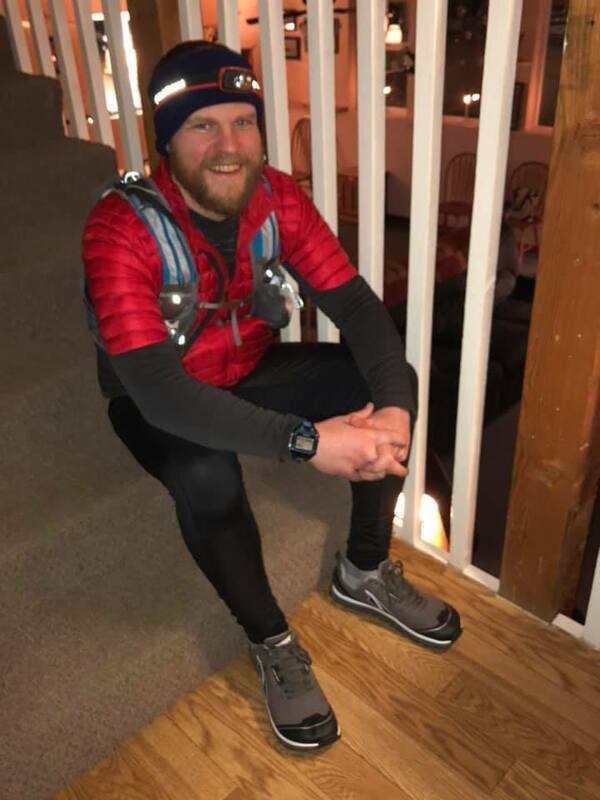 The race was from noon on Saturday to noon on Sunday, so around 1:00 AM Sunday morning when I started getting sleepy, I went and slept in my truck for about 5 hours. Considering the long break, and that it’s a really hilly course, I felt pretty good about getting in 66 miles, which was good enough for 3rd place. Now that race week is upon me, I’m keeping my eyes firmly planted on the weather report for Friday and Saturday. Right now they’re calling for a high in the mid-to-upper 70s, with an overnight low in the low 40s or even high 30s. That high temp is a little warmer than I would like, although that will be nothing compared to the 100+ temps I faced when I DNF’d at Pine to Palm a few years ago. 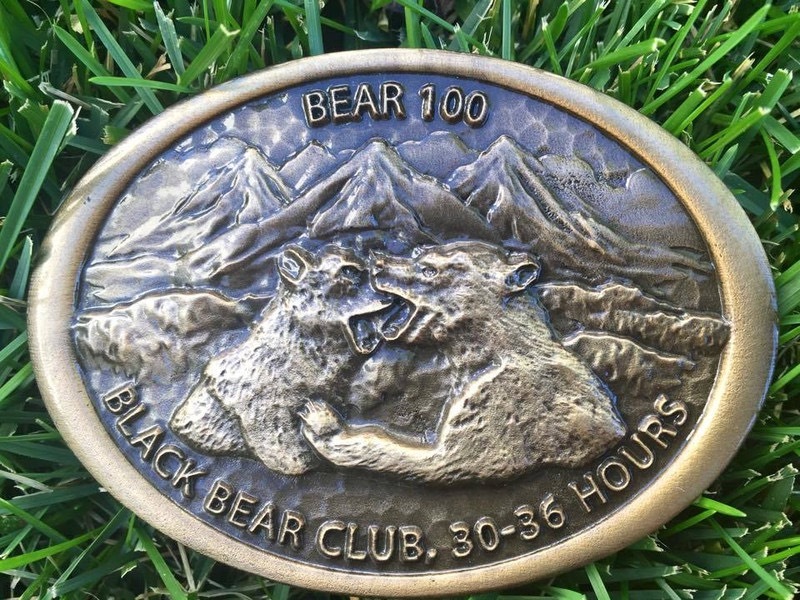 Technically, this race offers 3 different belt buckles depending on finishing time (under 24 hours, 24-30 hours, 30-36 hours). I think that’s a pretty neat touch, but I know that this is going to be a very difficult race, and in all honesty I’ll just be happy to finish under the cutoff. If you’re so inclined, I’m bib #311, and live tracking will be available on race day. 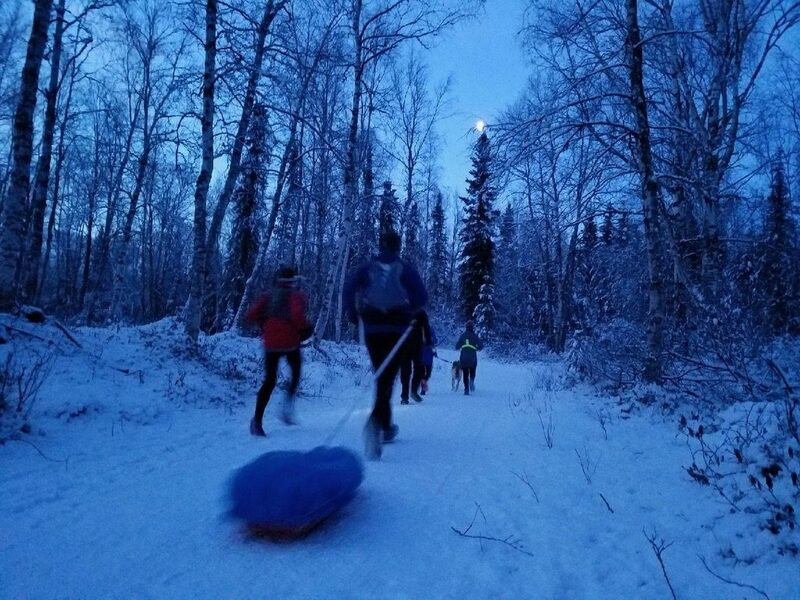 I’ve been spending the past several months training for my second running of the Susitna 100, coming up in two weeks from today. We’ve had another interesting winter here in Alaska, with not a lot of snow, and it hasn’t gotten particularly cold until just recently. The extended forecast doesn’t go out all the way to race day yet, but it’s currently showing temps in the mid 30s at the start of race week. We could end up with even higher temps than last year! I feel much more confident going into the race this year, now having done it once before. 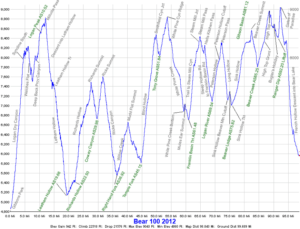 With a long race like this in the winter, there are just so many different variables and things that can go wrong. 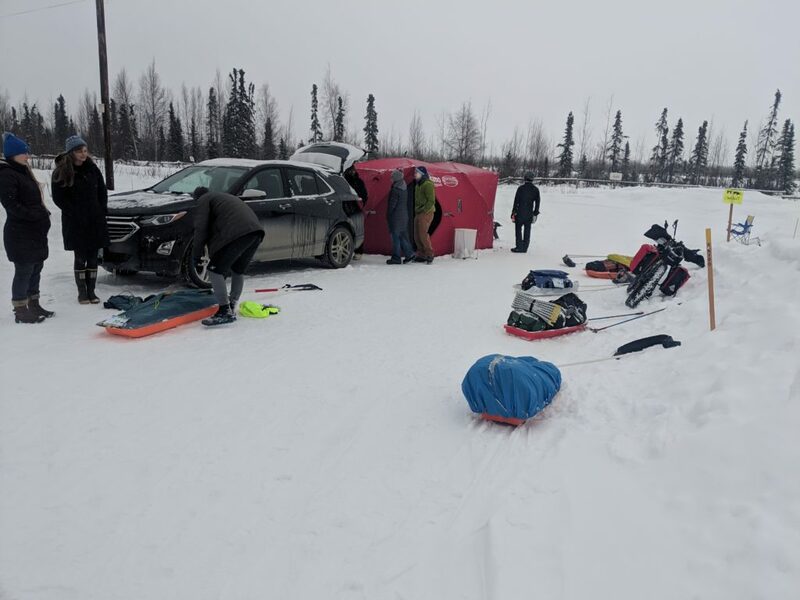 I’ve already got my sled situation figured out, and I won’t have a camera crew following me this year, all I have to do is run 100 miles in the middle of the Alaskan winter – easy peasy! I’ve had the good fortune lately to be able to do most of my long runs with a group, which has certainly helped. 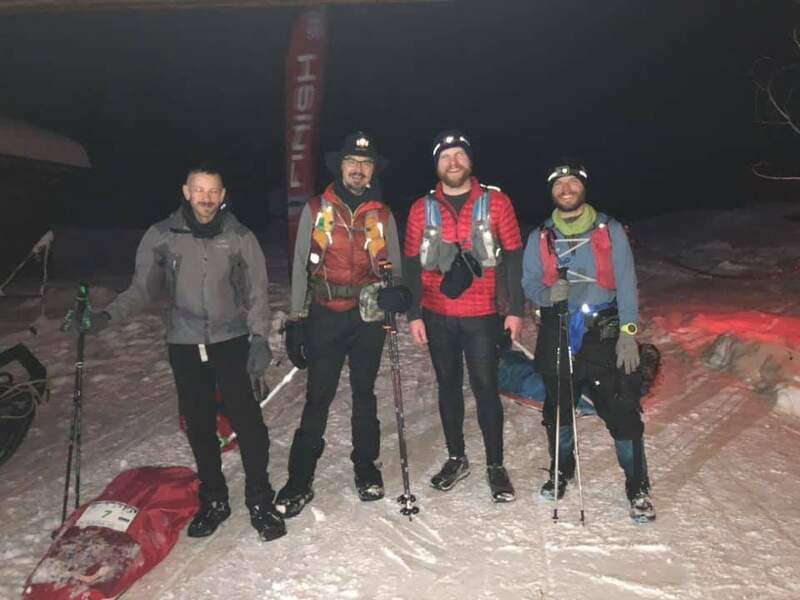 Two weekends ago, I ran a 30 miler pulling my sled in single digit temperatures, and was very thankful to have friends out there with me. 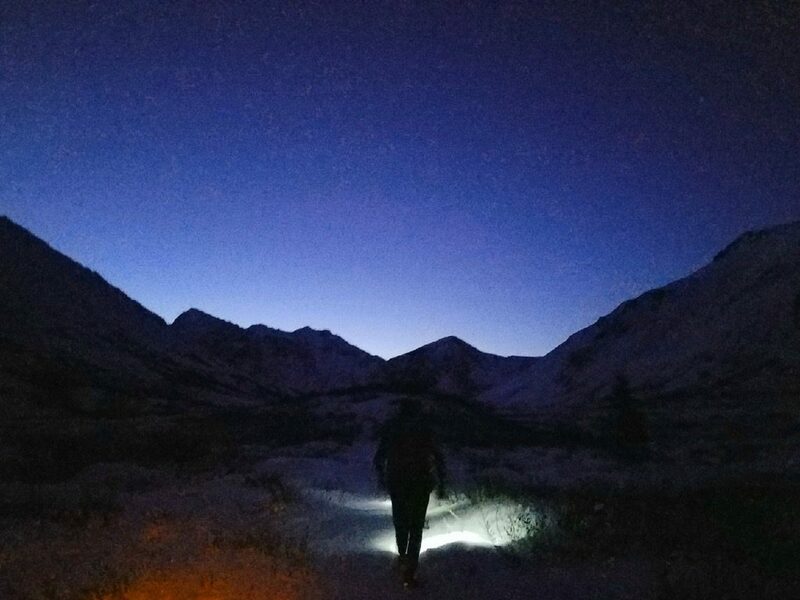 There have been many early mornings in the past weeks and months, preparing my body and mind for the many long miles that await me at Susitna. I’m looking forward not only to the challenge of the race, but also to being “out there” for many hours with friends old and new. I’ve said it before, but especially up here with a relatively small ultra community, these races are a lot like a family reunion. I can’t wait to see everyone and spend some (or a lot of) time on the trail with them.